A neutrino detector is a physics apparatus which is designed to study neutrinos. Because neutrinos only weakly interact with other particles of matter, neutrino detectors must be very large to detect a significant number of neutrinos. Neutrino detectors are often built underground, to isolate the detector from cosmic rays and other background radiation. The field of neutrino astronomy is still very much in its infancy – the only confirmed extraterrestrial sources so far as of 2018 are the Sun and the supernova 1987A in the nearby Large Magellenic Cloud. Another likely source is the blazar TXS 0506+056 about 3.7 billion light years away. Neutrino observatories will "give astronomers fresh eyes with which to study the universe." Clyde Lorrain Cowan Jr was an American physicist, the co-discoverer of the neutrino along with Frederick Reines. The discovery was made in 1956 in the neutrino experiment. Frederick Reines received the Nobel Prize in Physics in 1995 in both their names. Frederick Reines was an American physicist. He was awarded the 1995 Nobel Prize in Physics for his co-detection of the neutrino with Clyde Cowan in the neutrino experiment. He may be the only scientist in history "so intimately associated with the discovery of an elementary particle and the subsequent thorough investigation of its fundamental properties". John Norris Bahcall was an American astrophysicist, best known for his contributions to the solar neutrino problem, the development of the Hubble Space Telescope and for his leadership and development of the Institute for Advanced Study in Princeton. The Homestake experiment was an experiment headed by astrophysicists Raymond Davis, Jr. and John N. Bahcall in the late 1960s. Its purpose was to collect and count neutrinos emitted by nuclear fusion taking place in the Sun. Bahcall did the theoretical calculations and Davis designed the experiment. After Bahcall calculated the rate at which the detector should capture neutrinos, Davis's experiment turned up only one third of this figure. The experiment was the first to successfully detect and count solar neutrinos, and the discrepancy in results created the solar neutrino problem. The experiment operated continuously from 1970 until 1994. The University of Pennsylvania took it over in 1984. The discrepancy between the predicted and measured rates of neutrino detection was later found to be due to neutrino "flavour" oscillations. Masatoshi Koshiba is a Japanese physicist, known as one of the founders of Neutrino astronomy and jointly won the Nobel Prize in Physics in 2002. Moisey Alexandrovich Markov was a Soviet physicist-theorist who mostly worked in the area of quantum mechanics, nuclear physics and particle physics He is particularly known for having proposed the idea of underwater neutrino telescopes in 1960 that was originally developed in the master thesis of his student Igor Mikhailovich Zheleznykh. Cherenkov radiation is an electromagnetic radiation emitted when a charged particle passes through a dielectric medium at a speed greater than the phase velocity of light in that medium. The characteristic blue glow of an underwater nuclear reactor is due to Cherenkov radiation. When astronomical bodies, such as the Sun, are studied using light, only the surface of the object can be directly observed. Any light produced in the core of a star will interact with gas particles in the outer layers of the star, taking hundreds of thousands of years to make it to the surface, making it impossible to observe the core directly. Since neutrinos are also created in the cores of stars (as a result of stellar fusion), the core can be observed using neutrino astronomy. Other sources of neutrinos- such as neutrinos released by supernovae- have been detected. There are currently goals to detect neutrinos from other sources, such as Active Galactic Nuclei (AGN), as well as Gamma-ray bursts and Starburst galaxies. Neutrino astronomy may also indirectly detect dark matter. The Cowan–Reines neutrino experiment was conducted by Clyde L. Cowan and Frederick Reines in 1956. The experiment confirmed the existence of neutrinos. Neutrinos, subatomic particles with no electric charge and very small mass, had been conjectured to be an essential particle in beta decay processes in the 1930s. With neither mass nor charge, such particles appeared to be impossible to detect. The experiment exploited a huge flux of (hypothetical) electron antineutrinos emanating from a nearby nuclear reactor and a detector consisting of large tanks of water. Neutrino interactions with the protons of the water were observed, verifying the existence and basic properties of this particle for the first time. The DUMAND Project was a proposed underwater neutrino telescope to be built in the Pacific Ocean, off the shore of the island of Hawaii, five kilometers beneath the surface. It would have included thousands of strings of instruments occupying a cubic kilometer of the ocean. An air shower is an extensive cascade of ionized particles and electromagnetic radiation produced in the atmosphere when a primary cosmic ray enters the atmosphere. When a particle, which could be a proton, a nucleus, an electron, a photon, or (rarely) a positron, strikes an atom's nucleus in the air it produces many energetic hadrons. The unstable hadrons decay in the air speedily into other particles and electromagnetic radiation, which are part of the shower components. The secondary radiation rains down, including x-rays, muons, protons, antiprotons, alpha particles, pions, electrons, positrons, and neutrons. The Pierre Auger Observatory is an international cosmic ray observatory in Argentina designed to detect ultra-high-energy cosmic rays: sub-atomic particles traveling nearly at the speed of light and each with energies beyond 1018 eV. 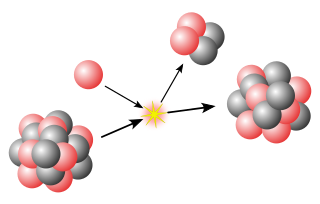 In Earth's atmosphere such particles interact with air nuclei and produce various other particles. These effect particles (called an "air shower") can be detected and measured. But since these high energy particles have an estimated arrival rate of just 1 per km2 per century, the Auger Observatory has created a detection area of 3,000 km2 (1,200 sq mi)—the size of Rhode Island, or Luxembourg—in order to record a large number of these events. It is located in the western Mendoza Province, Argentina, near the Andes. The IceCube Neutrino Observatory is a neutrino observatory constructed at the Amundsen–Scott South Pole Station in Antarctica. Its thousands of sensors are located under the Antarctic ice, distributed over a cubic kilometre. The NESTOR Project is an international scientific collaboration whose target is the deployment of a neutrino telescope on the sea floor off Pylos, Greece. Astroparticle physics, also called particle astrophysics, is a branch of particle physics that studies elementary particles of astronomical origin and their relation to astrophysics and cosmology. It is a relatively new field of research emerging at the intersection of particle physics, astronomy, astrophysics, detector physics, relativity, solid state physics, and cosmology. Partly motivated by the discovery of neutrino oscillation, the field has undergone rapid development, both theoretically and experimentally, since the early 2000s. The Cubic Kilometre Neutrino Telescope, or KM3NeT, is a future European research infrastructure that will be located at the bottom of the Mediterranean Sea. It will host the next-generation neutrino telescope in the form of a water Cherenkov detector with an instrumented volume of about five cubic kilometres distributed over three locations in the Mediterranean: KM3NeT-Fr, KM3NeT-It and KM3NeT-Gr. The KM3NeT project continues work done under the ANTARES, NEMO and NESTOR neutrino telescope projects. The Baikal Deep Underwater Neutrino Telescope (BDUNT) is a neutrino detector conducting research below the surface of Lake Baikal (Russia) since 2003. The first detector was started in 1990 and completed in 1998. It was upgraded in 2005 and again starting in 2015 to build the Baikal Gigaton Volume Detector (Baikal-GVD.) BDUNT has studied neutrinos coming through the earth with results on atmospheric muon flux. BDUNT picks up a lot of atmospheric neutrinos created by cosmic rays interacting with the atmosphere — as opposed to cosmic neutrinos which can give clues to cosmic events and are therefore of greater interest to physicists. Herbert Hwa-sen Chen was a theoretical and experimental physicist at the University of California at Irvine known for his contributions in the field of neutrino detection. Chen's work on observations of elastic neutrino-electron scattering provided important experimental support for the electroweak theory of the standard model of particle physics. In 1984 Chen realized that the deuterium of heavy water could be used as a detector that would distinguish the flavors of solar neutrinos. This idea led Chen to develop plans for the Sudbury Neutrino Observatory that would eventually make fundamental measurements demonstrating that neutrinos were particles with mass. TXS 0506+056 is a very high energy blazar – a quasar with a relativistic jet pointing directly towards Earth – of BL Lac-type. With a redshift of 0.3365 ± 0.0010, it is about 1.75 gigaparsecs from Earth. Its approximate location on the sky is off the left shoulder of the constellation Orion. Discovered as a radio source in 1983, the blazar has since been observed across the entire electromagnetic spectrum. ↑ Cowan, C. L., Jr.; Reines, F.; Harrison, F. B.; Kruse, H. W.; McGuire, A. D. (1956). "Detection of the free neutrino: A Confirmation". Science . 124 (3124): 103–104. Bibcode:1956Sci...124..103C. doi:10.1126/science.124.3212.103. PMID 17796274. ↑ "The Nobel Prize in Physics 1995". Nobel Foundation . Retrieved 2013-01-24. ↑ Davis, R., Jr.; Harmer, D. S.; Hoffman, K. C. (1968). "A search for neutrinos from the Sun". Physical Review Letters . 20 (21): 1205–1209. Bibcode:1968PhRvL..20.1205D. doi:10.1103/PhysRevLett.20.1205. ↑ "The Nobel Prize in Physics 2002". Nobel Foundation . Retrieved 2013-01-24. ↑ Reines, F.; et al. (1965). "Evidence for high-energy cosmic-ray neutrino interactions". Physical Review Letters . 15 (9): 429–433. Bibcode:1965PhRvL..15..429R. doi:10.1103/PhysRevLett.15.429. ↑ Achar, C. V.; et al. (1965). "Detection of muons produced by cosmic ray neutrinos deep underground". Physics Letters . 18 (2): 196–199. Bibcode:1965PhL....18..196A. doi:10.1016/0031-9163(65)90712-2. 1 2 3 4 5 6 Spiering, C. (2012). "Towards High-Energy Neutrino Astronomy". European Physical Journal H . 37 (3): 515–565. arXiv: 1207.4952 . Bibcode:2012EPJH...37..515S. doi:10.1140/epjh/e2012-30014-2. ↑ Markov, M. A. (1960). Sudarshan, E. C. G.; Tinlot, J. H.; Melissinos, A. C., eds. On high-energy neutrino physics. University of Rochester. p. 578. 1 2 3 4 5 6 Katz, U. F.; Spiering, C. (2011). "High-Energy Neutrino Astrophysics: Status and Perspectives". Progress in Particle and Nuclear Physics. 67 (3): 651–704. arXiv: 1111.0507 . Bibcode:2012PrPNP..67..651K. doi:10.1016/j.ppnp.2011.12.001. ↑ Overbye, Dennis (12 July 2018). "It Came From a Black Hole, and Landed in Antarctica - For the first time, astronomers followed cosmic neutrinos into the fire-spitting heart of a supermassive blazar". The New York Times . Retrieved 13 July 2018. ↑ "Neutrino that struck Antarctica traced to galaxy 3.7bn light years away". The Guardian. 12 July 2018. Retrieved 12 July 2018. ↑ Davis, Jonathan H. (2016-11-15). "Projections for Measuring the Size of the Solar Core with Neutrino-Electron Scattering". Physical Review Letters. 117 (21): 211101. arXiv: 1606.02558 . doi:10.1103/PhysRevLett.117.211101. ↑ Gelmini, G. B.; Kusenko, A.; Weiler, T. J. (18 May 2010). "Through Neutrino Eyes: Ghostly Particles Become Astronomical Tools". Scientific American . Retrieved 2013-11-28.